The Capital One Platinum currently has an Informr score of 7.5 out of 10. This score is based on our evaluation of 20 sources including reviews from users and the web's most trusted critics. Capital One Platinum is typically available to those with average credit scores (650 or greater). Ultimately, this card stands to benefit people who are committed to getting their credit score on the right track and are able to pay their balance in full and on time every month. 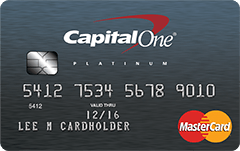 The no-frills Capital One® Platinum Credit Card has no annual fee, no balance transfer fee, and is designed to help users build their credit. But watch out for the high variable APR of 19.99% - 26.99% on purchases and balance transfers. Designed for people who are looking to improve their credit scores. It’s a card for average or fair credit, so if you’ve had trouble qualifying for other cards this one could be a good option for you. If your credit is just below qualifying for a standard rewards card but just above qualifying for a secured card, the Capital One Platinum is a solid choice. It’s designed for someone with an average credit score. It’s ideal for students and new graduates or anyone who has been an authorized user on someone else’s card. It’ll take a long time to grow out of, too, thanks to the expanding credit line. Security-conscious spenders (which should be all of us) will feel reassured by the protection built in to this card. If you’re looking to build a good history of credit, while having access to credit card-only perks, then the Capital One Platinum Credit Card is an excellent choice. The flexible payment schedule, credit line increase option, and online/mobile account access features make it a very appealing financial tool. Best for those who have had credit problems in the past, are just starting out, or have an "average" credit rating, but prefer an unsecured credit card over a secured card. Getting this Capital One credit card can work well in rebuilding your credit, provided you keep your spending in check and make payments on time.